A few weeks ago we were in Las Vegas for Liv's dance competition and had the "pleasure" of breakfast at Starbucks. While I wasn't overly thrilled with my burnt coffee and untoasted bagel, Olivia and her brother made a new discovery... Scones! Now I'm not sure Chocolate Chip Scones from Starbucks count as traditional, but the kids are thrilled with their new revelation and are now avid scone fans. Since we have come home, Liv has asked numerous times to try to repeat her Chocolate Chip Scone from that morning. Today we finally had an unscheduled morning and took to the computer to look for a recipe. I'm amazed at the number of scone recipes out there, Fruit Scones, Chocolate Scones, Whole Wheat Scones, Gluten Free Scones, Scones with frosting, and even savory scones. Epicurious provided an appealing Chocolate Chip Scone recipe that seemed to suit our taste and with some adaptations, we got to baking. The ingredients come together easily and quickly. Liv was careful not to over mix her dough as she put everything together and was rewarded with a lovely, tender, light chocolate chip scone. Although the recipe did not call for extra sugar on top, she felt that it would be a welcome addition (good call!) and we sprinkled raw sugar over the milk glaze for a nice added crunch. The dough was a tad sticky, but not difficult to work with on a lightly floured surface. Once the dough is patted into the round, I found that my pizza cutter, sprayed lightly with cooking spray, made a wonderful cutting tool. A wide spatula or bench scraper works well for transporting the fragile dough to the prepared pan. Frankly, I prefer fruit scones (blueberry will be up next! ), but these were truly good. This recipe would work well with just about any variation that you can think of, and I'm thinking that it will remain our base for future scone projects. Spray a baking sheet with cooking spray, or alternatively, line a baking sheet with parchment or a baking mat. In a large bowl add the flour, sugar, baking powder, baking soda and salt. Add butter, rubbing with fingertips until butter is reduced to pieces the size of rice grains. Mix in the mini chocolate chips. Measure buttermilk into a measuring cup and add egg yolk and vanilla. Whisk to combine. Add the buttermilk mixture to the dry ingredients and mix just until the dough comes together in moist clumps. Pour dough out onto a lightly floured board and gather into a ball (dough will be sticky). 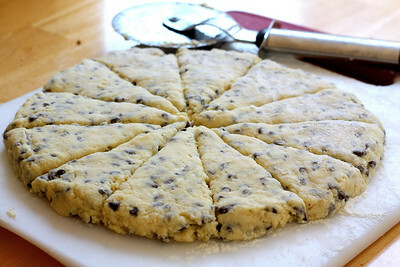 Press the dough out into an 8 inch round and cut into wedges. Transfer the wedges to the prepared cooking sheet, spacing 1 inch apart. Brush scones lightly with milk and sprinkle with raw sugar. Bake until the scones are browned and crusty on top, about 20 minutes. Ela... I don't know what to say! Thank you so much for the compliment, I am very honored! 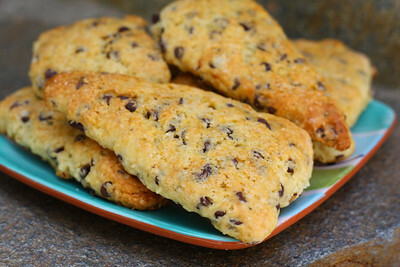 Choc chip scones sound good with tea, actually. I haven't made them in long time and like you, I like the fruit or savory ones. That said, I wouldn't turn this down at all. It looks great! Oh how I love scones. Chocolate & blueberry are my favorites. Yours looks delicious and perfect! Dionne, you are correct... anything with chocolate chips = good! Jean, my daughter loved these. Said maybe we could sell them to Starbucks! Lisa, blueberry is actually my favorite too... Panera Bread makes a wonderful one, I love to crunchy top! Chocolate chip scones would suit my taste too! Gina... they would work as a sub for your chocolate waffles! I love scones. This has inspired me to try making them.